Heat oven to 400°F. In large saucepan, combine 1 cup sugar and cornstarch. Add water; mix well. Bring to a boil, stirring constantly; cook and stir an additional minute or until thickened. Stir in fruit; return to a boil, stirring frequently. Remove saucepan from heat; stir in almond extract. Pour into ungreased 8-inch square (1 1/2-quart) baking dish. Lightly spoon flour into measuring cup; level off. In medium bowl, combine flour, 1/4 cup sugar, baking powder, margarine and milk; mix well. 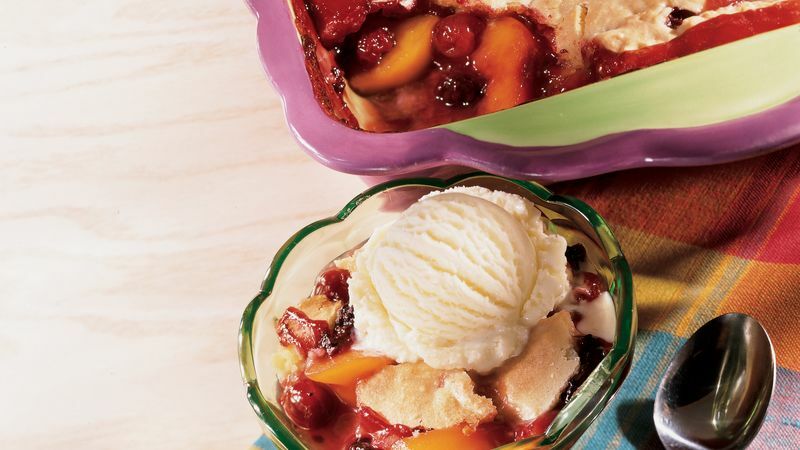 Drop dough by spoonfuls over hot fruit mixture. Bake at 400°F. for 20 to 25 minutes or until topping is golden brown. Cool 10 minutes before serving. Serve warm. If desired, top with Haagen-Dazs® Vanilla Ice Cream. Lumps can easily form in a cornstarch mixture. To prevent lumps from forming, mix cornstarch (and sugar in this recipe) with a cold liquid and stir until the cornstarch is dissolved. Then heat to boiling, stirring constantly. The mixture will turn transparent and thicken as it boils. Enjoy this warm dessert with a cup of cinnamon or amaretto-flavored coffee or cinnamon tea.